When considering what type of garage interior lighting fixture you should use there are two primary considerations to take into account: First, is there a high degree of moisture, dirt and dust in your area due to woodworking or automotive activities; and Second, will the temperature inside drop to below 50º fahrenheit during the course of the year. 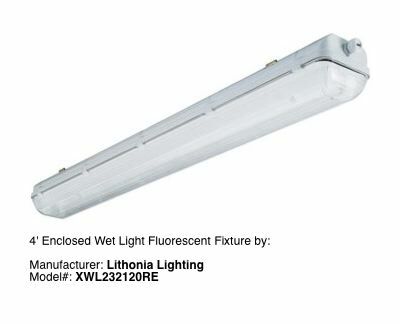 If you don't have the moisture, dirt, dust or temperature problem, then you can consider using standard 2 tube - fluorescent lighting fixtures in a garage lighting plan similar to the one shown on our Garage Lighting page and they should work fine for most general garage lighting conditions you will encounter. If you live in an area with big temperature swings over the course of any given year, then you will need a garage lighting fixture that can handle the temperature swings with no slow-starts, dimming or flicker problems. Let's look at the two primary specialty types of garage lighting fixture for your garage. The unit shown above is manufactured by Lithonia Lighting as a ceiling mount garage interior lighting fixture. It takes two (2) 32-watt T8 fluorescent bulbs which are not included with the unit. The fixture meets strict Energy Star Qualified requirements and purportedly reduces greenhouse gas emissions. The lens cover is a full wraparound prismatic that creates bright and even illumination. It uses an integrated residential electronic ballast to ensure rapid start times with no flicker making it ideal for a cold temperature garage that is not uniformly heated. The unit is not dimmable, and measures 3" in height, 10" in width, and 48" in length. The fixture frame is steel, comes in the color white, and can be gang-mounted one after another. This garage lighting fixture generally retails below $100.00 and the bulbs retail below $6.00 each. It is ideal for general or task lighting in your garage and the lens cover will help protect the fluorescent bulbs from collision with lumber or other lengthy items during their movement or usage. If you have the moisture, dust and dirt problem then your garage lighting plan will need to include a lighting fixture type capable of dealing with harsher conditions. 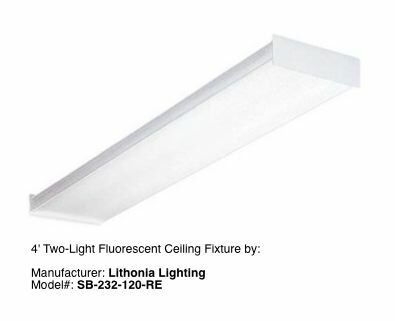 The unit shown above is manufactured by Lithonia Lighting as a ceiling mount garage interior lighting fixture that is IP65 rated for wet locations. The body accommodates two (2) 32-watt T8 or T5 fluorescent bulbs. The upper body is constructed of fiberglass with a continuous gasket. The lens is acrylic with retaining latches to ensure a tight seal. The overall length is in excess of 48" and the units can be gang-mounted one after another. This fixture has an electronic ballast and will start at temperatures down to 0 degrees F.
This lighting fixture generally retails below $120.00 and the bulbs retail below $6.00 each. This type of garage interior lighting fixture is ideal if you are spraying paints or solvents that have a flammable vapor that could drift up into the fluorescent bulb area and cause an arc fault between the closely spaced hot and cold legs of the bulb, while the current is flowing. Garage Tips: if your garage lighting plan requires fixtures longer than 48" then gang-mount two fixtures back to back in order to achieve the length you need. 48" fluorescent bulbs are easier to change than 96" long fluorescent bulbs and are more economical to replace and easier to store. Next, for some unique ideas about hard to light spots in your garage, study our Garage Wall Lighting page.